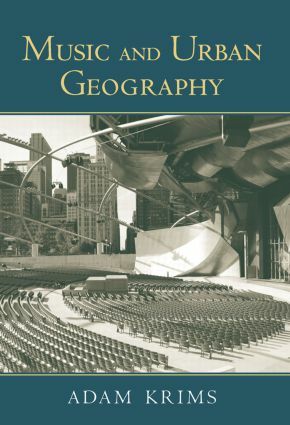 Music and Urban Geography is the first book to theorize musical aspects of the tremendous changes that have overtaken major cities in the developed world over the past few decades. Drawing on musicology, music theory, urban geography, and historical materialism, Krims maps changes not only in how music represents cities, but also in how music sounds and is deployed socially in new urban contexts. Taking on venerable musicological debates from entirely new perspectives, Krims argues that the cultural-studies approach now predominant in cultural musicology fails to address contemporary realities of production and consumption; instead, the social effects of space and new patterns of urban production play a shaping role, in which music takes on new forms and functions, with representation playing a significant but not always decisive role. While music scholars increasingly concern themselves with place, Krims theorizes it together with the shaping role of space. Pushing urban geography into new cultural contexts Music and Urban Geography will offer those concerned with the social effects of space newtheoretical models. Ranging from Anonymous 4 to Alanis Morissette, from CuraÃ§ao to Seattle, Music and Urban Geography presents a truly wide-ranging, interdisciplinary, and theoretically ambitious view of both musical and urban change.